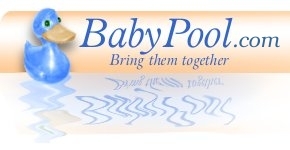 The BabyPool.com Baby Pool Page is where your guests get involved and become participants in your babypool. 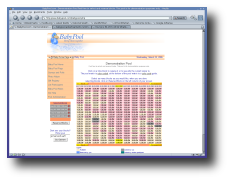 On the left side of the Baby Pool Page is the Pool Page Menu, and on the right you will find the BabyPool.com Pool Matrix. The Baby Pool Page menu starts with a link to the baby pool's Baby Pool Home Page so that your guests and participants can get back to your baby pool home. The second menu item is a listing of the current blocks selected for reservation, we will get to reserving blocks in a moment. When there are no blocks currently selected for reservation this section will display "No new blocks to reserve". When blocks have been selected for reservation a listing of the blocks selected will appear. This list will contain the information about each block as well as a link to delete it before it is reserved. Once a block is reserved only the babypool administrator can delete it. When there are blocks listed to be reserved a Reserve Blocks button is visible below the list of blocks. After a participant has finished selecting all of their blocks to be reserved they must click this button so that the blocks will be recorded. Regardless of what type of babypool you setup, a time based baby pool or a weight and length based babypool at the top of the Pool Matrix is a Pool Matrix Legend. This Legend displays the different colors of blocks that can be found on an active Pool Matrix. If the baby pool is a time based pool the first color in the legend is yellow. Yellow blocks denote the expected day of birth. Blocks that are available to be reserved are displayed in a more neutral almond color. Should you happen to be selecting blocks for reservation at the same time as other participants the blocks that others are reserving will appear in a dark teal and the blocks you have selected to be reserved will appear in a dark gray. After blocks have been reserved and they are "owned" by a participant they will appear in blue if they are owned by you or pink if owned by another participant. In a time based babypool the blocks will become a darker shade with the passing of time and will become "locked" or unable to be reserved because they no longer have a chance to be a winning block. The type of baby pool you setup at BabyPool.com will determine the type of Pool Matrix that is displayed on your Baby Pool Page. A time based baby pool will show days displayed horizontally in rows and hours of the day displayed vertically in columns. Weight and length babypool shows weight displayed horizontally in rows and length displayed vertically in columns. In a time based baby pool one block is one hour in a day, and each block displays the hour it corresponds to. In weight and length based babypool one block is an inch or centimeter of length to the set weight of a column. In a weight and length based baby pool the pool administrator can set the units of measure for the babypool to be English (inches, pounds, ounces) or Metric (centimeters, kilograms). At the four corners of the Pool Matrix are buttons to move the Pool Matrix either forward or backward. In a time based baby pool the Forward button will move the ahead in time in increments of 5 days, equal to 5 blocks. While the Back button will move the back in time in increments of 5 days, equal to 5 blocks. In a weight and length based babypool the Forward button will move the Pool Matrix ahead an increment of 1 pound or .45 kilograms or equal to 16 blocks and the Back button will move the Pool matrix back an increment of 1 pound or .45 kilograms or equal to 16 blocks.